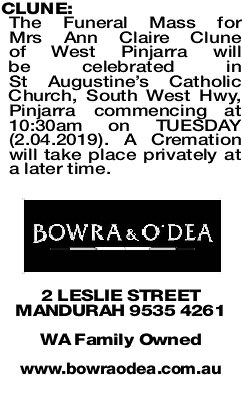 The Funeral Mass for Mrs Ann Claire Clune of West Pinjarra will be celebrated in St Augustine's Catholic Church, South West Hwy, Pinjarra commencing at 10:30am on TUESDAY (2.04.2019). A Cremation will take place privately at a later time. 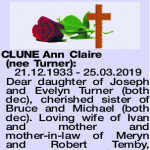 21.12.1933 - 25.03.2019 Dear daughter of Joseph and Evelyn Turner (both dec), cherished sister of Bruce and Michael (both dec). Loving wife of Ivan and mother and mother-in-law of Meryn and Robert Temby, Lucy and Stephen Brandenburg, and Timothy (Tim) and Anna (nee Gable). 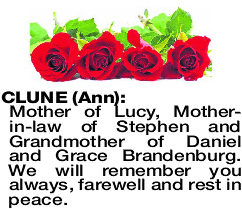 Special Nannie of Eamonn Lanagan, Tara Nababan, Peter Temby, Daniel and Grace Brandenburg and Samuel Clune. Caring friend of many and lover of nature and music. Thank you for being my wife. Thank you for being the mother of our children. Thank you for helping me on the farm. 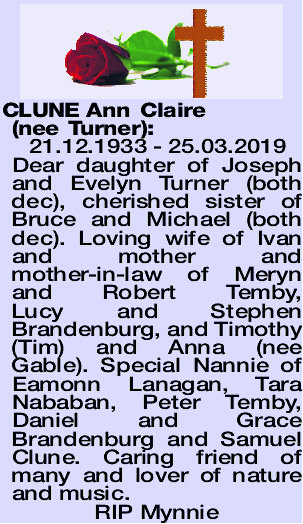 In memory of, and with thanks to, our dear mother, mother-in-law and Nan. Her caring, kind and diligent ways will always be remembered. 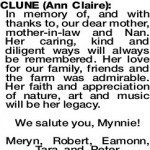 Her love for our family, friends and the farm was admirable. Her faith and appreciation of nature, art and music will be her legacy. Thank you for being my mother. Thank you for being a beautiful mother- in-law. Thank you for being the best Nannie. 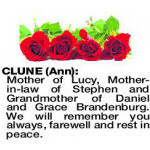 Tim, Anna and Sammy P.
CLUNE ANN Mother of Lucy, Mother- in-law of Stephen and Grandmother of Daniel and Grace Brandenburg. We will remember you always, farewell and rest in peace. 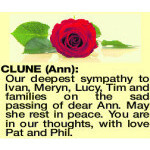 CLUNE ANN Our deepest sympathy to Ivan, Meryn, Lucy, Tim and families on the sad passing of dear Ann. May she rest in peace. You are in our thoughts, with love Pat and Phil. 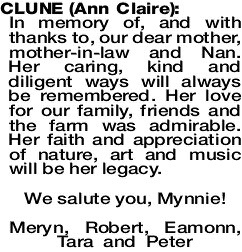 Happy memories of dear Ann. Sister-in-law of Lottie and Bert Green (both dec). 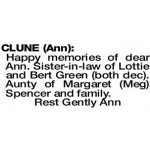 Aunty of Margaret (Meg) Spencer and family. 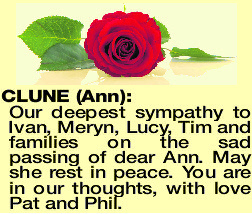 Deepest sympathy to Ivan, Meryn, Lucy, Tim and Family on the sad loss of Ann. A generous, caring, hard working lady. May she Rest in Peace. 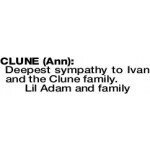 Deepest sympathy to Ivan and the Clune family.